Community banks tout themselves as better than national and regional banks because of how close they are to their communities. Pundits, including myself, have been critical that our industry has moved away from this model in pursuit of growth to many communities, where they end up being another bank IN the community, rather than THE bank of the community. But this opinion ignores the generations of history many banks across our great land have built. A case in point: the First National Bank of Hallstead… now Peoples National Bank (see photo). When the bank opened in 1905, Hallstead was already a thriving community. It was a northbound terminus of the Delaware, Lackawanna and Western Railroad (DL&W) used to move coal northward that was being mined in Lackawanna and Luzerne Counties. Hallstead bustled with manufacturing, a lively tourist trade drawn by the natural beauty of the area on the banks of the Susquehanna River, and a full complement of small businesses to serve the needs of the town and surrounding rural communities. Prior to the bank’s founding, townspeople and businesses turned to the north, Binghamton, for their banking needs. After six months in business, the bank posted profits of $750*. The town and the bank continued to grow. The bank showed deposits of $596,589 prior to the stock market crash of 1929 (approximately $10 million in today’s dollars). In 1933, as a result of the depression, deposits had fallen to $393,299 where they remained for most of the depression. The bank closed during the national bank holiday that was ordered by President Roosevelt in 1933. However, they proudly reopened after examiners audited the books and pronounced them safe and sound. Reportedly, the First National Bank of Hallstead was the first in the country allowed to open for business. And so it went in Hallstead, growing gradually, as towns tended to do in rural Pennsylvania, with bank loans funded by local depositors supporting the growth. 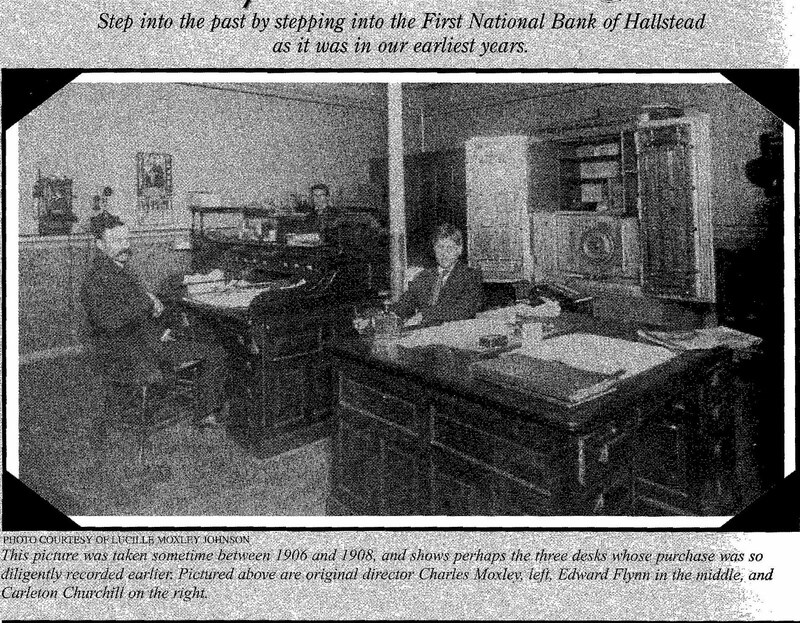 In 1965, the First National Bank of Hallstead merged with nearby Hop Bottom National Bank to form today’s Peoples National Bank. One hundred years ago, much of the region the bank served was like the nation as a whole outside of metropolitan areas: rural, agrarian, with limited manufacturing. Over the course of the bank’s history, that has changed remarkably. Small farms gave way to manufacturing which, in turn, gave way to service industries. During Peoples National Bank’s recent past, hallmark local businesses have either gone away or significantly downsized. But the communities the Bank serves continue to be resilient. Today, renewal may come in the form of what is under the ground, rather than above it, similar to the salad days of the anthracite coal industry. Much of the Marcellus Shale formation runs through the bank’s markets, and interest from those wishing to harvest the natural gas that lies beneath is creating pockets of newfound wealth. Throughout the economic ups and downs that have befallen the national and local economies, Peoples National Bank and its predecessor banks the First National Bank of Hallstead and Hop Bottom National Bank have endured and helped their communities endure. In 2009, despite the most significant banking crisis since the Great Depression, Peoples National Bank's parent company sported a 1.07% return on average assets and a 12.62% return on average equity. Their history, similar to the histories of hundreds, if not thousands, of community banks across our landscape, is our history. They helped our communities thrive, deal with tough times, and thrive again. They take deposits from us and our neighbors, and lend it to us and our neighbors. They were critical to the start of many businesses in our communities that now employ us. Banks like Peoples National Bank employ me and my firm, and I am proud to be part of this industry. To my community banking (thrifts and credit unions too) brethren: Occasionally I would like to highlight the history of a community bank and how it made a difference in the evolution of the communties it serves. If you have stories similar to the above, please let me know. I think it is important as our industry goes through tremendous changes that pull us away from our communities and towards mass commoditization, to step back and recognize what made us unique in the first place. *Many of the facts in this post came from Peoples National Bank 100 Year Anniversary booklet, published in 2005. Note: I make no investment recommendations in my blog. Please do not claim to invest in any security based on what you read here. You should make your own decisions in that regard. I have a tough enough time making investment decisions on my own. "Without vision, the people perish." You call yourself a brand manager?